Type and Use: Cool season biennial, grown as an annual with edible leaves and bulb. Bulbs are good for slicing raw in salads or stir frying. Planting Dates: In general, February 20 - March 10 and August 15 - September 15. Planting Method: Direct seeding in the garden is best even though kohlrabi does transplant easily. The disturbance of the roots does hurt the bulb development. If you do choose to use transplants, use small plants. Plant in rows, double rows or hills. Plant seed ¼ - ½ inch deep. Cover the area with a thin layer of compost to prevent crusting. Harvest Time: Approximately 50-60 days from planting. Expect about 20-40 bulbs per 10 feet of row. 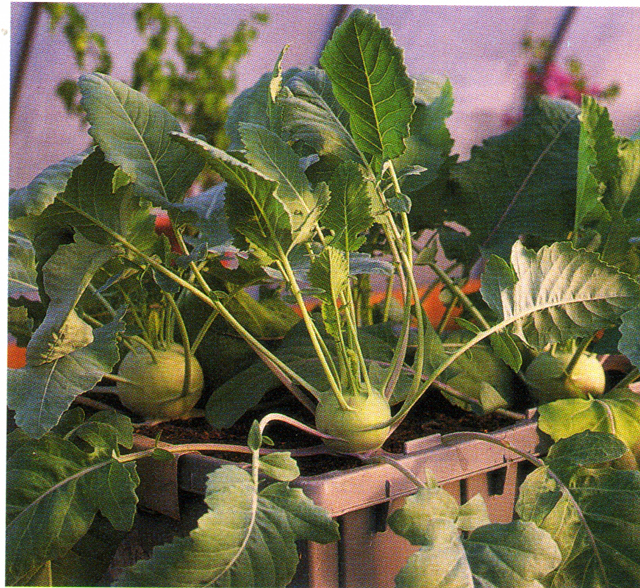 Growth Habits: Kohlrabi is a turnip-like bulb that forms above the ground and has leaves growing from it. It’s actually an enlarged stem. It is quite drought-tolerant because of its extensive root system. Very fast growing. Culture: Kohlrabi’s cultural requirements are similar to broccoli. Easy to grow and productive in healthy soil. Likes large amounts of organic matter. Use plenty of compost, lava, soft rock phosphate, and mulch. Fertilize two times per season with an organic fertilizer. Best to plant in raised beds, rows, or hills. Considered a cool-season vegetable but can stand fairly high temperatures like its close kin the turnip. Troubles & Solutions: Bulbs get woody in hot weather or it the small seedlings dry out during establishment. Treat aphids with molasses spray and release beneficial insects such as ladybugs and green lacewings. Control cabbage loopers and green worms with the release of trichogramma wasps. Spray serious infestations with citrus-based mixes. Control downy mildew and other diseases with Garrett Juice plus additives and cornmeal in the soil at 20 pounds/1,000 square feet. Harvest and Storage: Harvest the leaves any time and eat fresh in salads or cook as greens. Harvest the bulbs when they are 2-3 inches or slightly larger. Fall crops can be harvested at a larger size. Will keep more than 6 weeks at 32-40°. Notes: Tough bulbs can result from stress. The stress can be caused by too much or too little water, too much or too little fertilizer, or soil compaction or salt build up. Varieties: Grand Duke, White Vienna, Purple Danube, Super Schmeltz, Grand Duke hybrid, and White Vienna.